Strawberries and cream popsicles are the perfect healthy summer snack for kids young and old. Well, strawberry season has officially come to an end at our farm. I’m sad but I am ending the season on a positive note by sharing these delicious Strawberries and Cream Popsicles with you. Our Jersey Fresh strawberries have a special place in my heart. There is nothing like a jersey strawberry. The are as red as can be and oh so sweet. Their biggest downfall is the short season they have. I make sure I freeze plenty to use in smoothies and my favorite strawberry daiquiri recipe throughout the year. On a side note, strawberries are so simple to freeze. I simply rinse, cut the tops off and spread out on a parchment -lined baking sheet . I pat them dry and then flash freeze them for about an hour. Once frozen, you can store them in either quart sized or gallon sized freezer bags. When you are ready to make a smoothie, bake or whip up your favorite cocktail, just grab out of the freezer and use what you need. I love having simple and healthy ingredients on hand at all times. Freezing your own is much more cost-effective too. Popsicles bring out my inner child. I love to make them because the flavor combinations are endless and they are much less expensive to whip a batch up at home. For this recipe, I blended all the ingredients in a blender . It’s pretty healthy too because the “cream” is actually non-fat greek yogurt. I then poured the strawberry mixture into the popsicle mold and froze for 6 hours. To unmold, gently run warm water on the mold to loosen the popsicles. Now that summer has officially arrived, I make sure I keep a good stock of homemade popsicles in my freezer. My pool house freezer is basically a revolving door in the summer months. The kids and their friends are always opening it up looking for a cold refreshing treat. These Strawberries and Cream Popsicles are always a refreshing hit! Hope your summer is off to a great start! Add all ingredients to a blender. Pulse until incorporated. 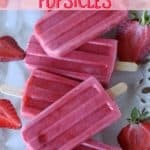 If you like chunks of strawberries in your popsicles, pulse to incorporate. To unmold, gently run bottom of mold under warm water.